As I sit here on this rainy Bank Holiday Monday, my mind goes back to the very different weather I was enjoying this time last week. DD and I were in Italy, on our long-planned Big Birthday trip to celebrate her 40th birthday and my 65th, and we were revelling in cloudless blue skies and 30 degree temperatures. However, contrary to what you might expect from a mother-daughter holiday, we were neither sunning ourselves on the beach nor hitting the Italian shops for the latest fashions. Instead we were exploring, with ever-increasing fascination, the narrow, winding streets, ancient churches and other wonderful buildings of one of the most beautiful and best-preserved small mediaeval towns in Italy – Assisi. We were on a 4-day pilgrimage to the town forever associated with Saint Francis, and it was an unforgettable experience. As yet it is an experience I haven’t had chance to reflect on, as within two days of my return home, Grandsons #1 and 2 arrived to spend half-term with us. They do so at this time every year, and, as always, spare time flies out of the window until they go home again. So until then I will leave you with a few tantalising glimpses of another of my very special places. In the Transit household, as in most others, there are differences of opinion between DH and myself on many subjects – in this case, as to the value of keeping things. Not to put too fine a point on it, DH is an inveterate hoarder, an almost indiscriminate keeper of “stuff that might come in useful one day”. I, on the other hand, am simply a discriminating guardian of things worth preserving. At the same time, I’m a mainstay of the local charity shops, that is, if I can manage to sneak the bags out to the car, without DH catching me in the act. But even when I’m in my most fervent house-clearing mode, there are some categories of object at which I draw the line. Books, for instance, unless they are library books, only ever come into the house, never out again. I think I must be almost constitutionally incapable of throwing a book away. After all, books make excellent insulation. Given my passion for making preserves, I will admit also to finding it hard to throw jam-jars away, but of course I really do need those, don’t I? And then there are the souvenirs…. Whether it’s a postcard in childish handwriting from a long-ago holiday with grandparents, or a vase that belonged to my mother, and possibly to her mother before her, if it has sentimental value to me, it’s worth keeping and I’ll leave the throwing-away to those who come after me. However, occasionally I do look at something and wonder whether one can take sentimental attachment too far. The example that comes to mind lives in the cupboard under the sink. It’s a smallish, white, plastic tub, with a cracked and mended pale-blue lid, and long ago it bore a label proclaiming that inside was the then new and magic powder known as Napisan. Today it holds dishwasher powder and I handle it every day. To be honest, it is barely fit for purpose, but I simply can’t bring myself to stop using it and throw it away. 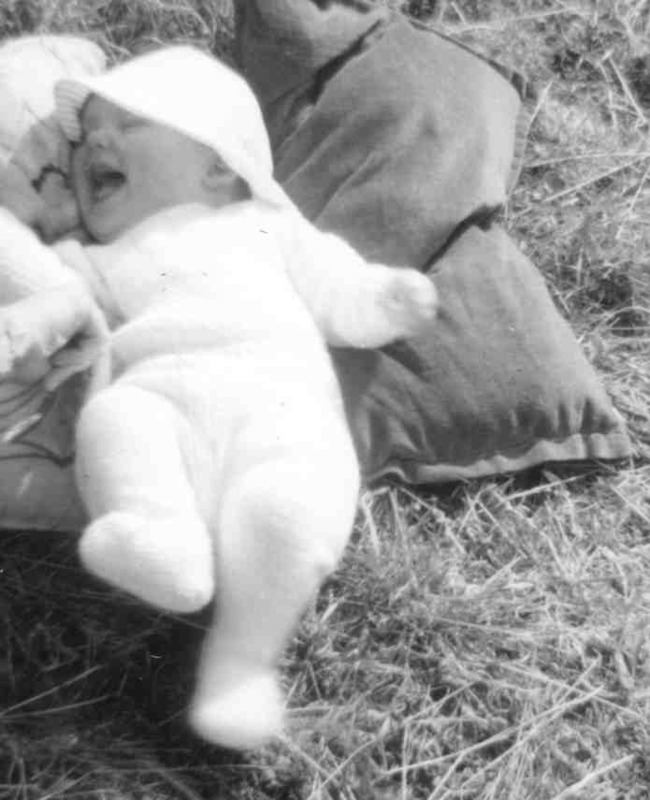 Over forty-two years ago, when DS was born, I was plunged into a new and exhausting world of terry nappies and endless washing, with no washing machine to lighten the load. The height of technological innovation in our kitchen was the gleaming new spin-dryer which DH’s parents kindly gave us for our first Christmas in our new home. But I had one great advantage over my mother at the same stage – I had Napisan. Instead of having to boil all the baby’s things, I could simply soak them in this wonderful solution and hey presto – white again! The nappies went for cleaning rags decades ago, and the baby who wore them now has a rapidly-growing son of his own, but as long as I can pick up that battered tub and take off its mended lid, I have a concrete link to those far-off days. With the tub in my hand my mind fills with memories of babyhood and a lot of hard work and happiness, when I was young and thin, and my first baby wore hand-knitted leggings and his nappies were soaked in Napisan. 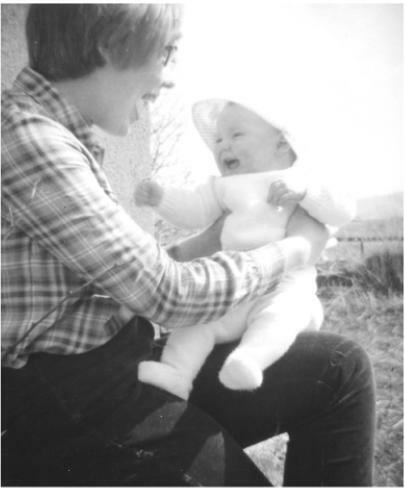 I’m such a sentimental old fool – or am I? ﻿﻿﻿﻿﻿﻿﻿﻿﻿﻿﻿﻿﻿﻿Sixty-six years ago this weekend, on May 8th 1945, World War II came to an end in Europe. Twenty years later, as a very young 19 year-old, I was working in Hamburg, scene of some of the most devastating bombing of that war. I was spending six months abroad, first in Germany, then in France, to improve my spoken-language skills before taking up my place at Oxford University to read modern languages. 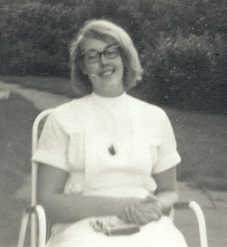 When I wrote to the employment office in Hamburg to find work, I was offered the choice between working in a department store and finding my own accommodation, or as a nursing orderly in a council care home, with a room provided in the nurses’ hostel. I chose the latter and it was one of the best decisions I ever made. I arrived in early March a shy and rather unworldly girl and left for France in mid-June, having grown up more than I would have thought possible in three months, thanks to the work I had done and the people I had met while doing it. The first few weeks of work passed in a blur of new surroundings, people, language, and a demanding 47-hour working week, which left me exhausted by the end of my shift at 7pm. Gradually, however, I adjusted to the routine, learned names and faces and started to make sense of the local accent and dialect. As I did so, personalities began to emerge, first among my colleagues, who were kindness itself to this young foreigner, then among the residents, most of whom were fascinated, and indeed charmed, to have “eine junge Engländerin” (an English girl) changing their beds, dishing up their food, and later feeding, washing and caring for the more incapacitated among them. Forty-six years on, when I think back to those days, three in particular of those residents still come vividly to mind – their names, their faces and, above all, what I learned from them. The first I only knew for a very short time, as she died on Good Friday, only a month after my arrival. Her name was Frau Kaakschlief and she was totally paralysed, so that we had to do everything for her. In constant pain from dreadful bed-sores, which nothing seemed to alleviate, helpless and increasingly weak, she still managed to summon up the most beautiful smile and a whispered “Danke” whenever anyone did her the slightest service. I came on duty that Good Friday morning to find my colleagues in tears. Frau Kaakschlief had died in the night, and though none of us could have wished her back, we missed her dreadfully and I doubt any of us ever forgot her smile, her patient courage and her amazing dignity. The second was Frau Fliege and I remember her, not for her words, for she could no longer speak, but for the harsh injustice of the illness which had reduced her to this state. She was in the last stages of tertiary syphilis, caught from her soldier husband during or after the war, and undiagnosed until it was too late to avoid the worst this dreadful disease can do. As I sat by the bed to feed this tiny, bird-like figure, or helped to change her and her bedding with monotonous regularity, I learned a great deal about the unfairness of life, but also about the deep humanity of my colleagues, who treated even this shell of a woman with unfailing care and respect. I was growing up very fast. The third unforgettable resident was totally different. She could definitely speak, and did so with great humour, considerable intelligence and a wide experience and understanding of life and human nature. Her name was Frau Vagt, but she was known universally as Oma or Granny Vagt. Oma Vagt was a short, strong, stocky woman, with a broad face and even broader grin, who had worked hard all her life, and though by then over 80, went on working because she wanted to. By the time we day-shift workers came on duty at 7am, Oma would be up and busy in the ward kitchen, sorting out individual coffee pots for everyone’s breakfast. Later she would help with the washing-up and would have helped with the cleaning too, if we had let her. Every afternoon I had a two-hour break in my twelve-hour shift and quite often would go to Oma’s room (shared with 3 others) and chat with her. She loved company, was a born raconteuse and enjoyed nothing more than an opportunity to reminisce about life in Hamburg before, during and after the war. Finding in me a very willing listener, she was in her element and we spent many happy hours together. 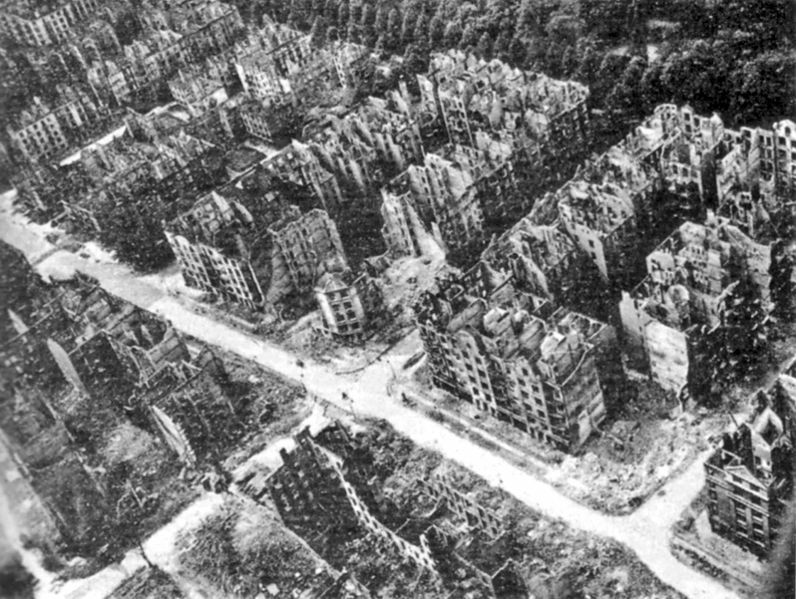 One unforgettable afternoon the conversation turned to the wartime bombing of Hamburg. Back then Oma and her family had run a dairy in a working-class area near the docks, called Rothenburgsort. In late July 1943 the Allies launched a massive bombing raid on Hamburg which culminated in the deadly firestorm that totally destroyed the docks and the surrounding areas, and killed and injured tens of thousands of people. On that sunny spring day Oma described to me how everyone in her street had had to make a fateful decision that night - whether to shelter in the cellars under their homes or try to escape to surrounding areas which were being less heavily bombed. As she put it to me very starkly “Those who left, lived. Those who stayed, died.” She and her family made a run for it, as did a few others in her street. When they went back after the fires were finally extinguished, it was to find that their homes, their friends and neighbours, indeed their entire district, had disappeared. Shocked and horrified, I sat by Oma’s bed and listened to her telling her story quite simply and unselfpityingly, with no note of anger or hatred or reproach in her voice. This was what happens in war, her attitude said, and it didn’t prevent us becoming friends across all the barriers of language and nationality, of age and experience, which could so easily have divided us. This lesson in tolerance and acceptance sank in deeply and has in part moulded the person I now am. Three elderly women, in a different country and in what is now a different age. Three women whose names and faces are indelibly engraved on my memory and who between them taught me lessons I still treasure and try to live by, not so much because of what they said or did, as because of who and what they were. Being retired, DH and I usually find that bank holidays pass us by almost un-noticed, except for the lack of postal delivery or the fact that the village shop is closed. This morning, however, when I drew back the bedroom curtains to see yet another gloriously sunny and cloudless morning, we decided that we really ought to mark the bank holiday by doing one of our favourite walks. Directly opposite where we are staying is a promontory separating a pretty little river from the wide and beautiful Kyle of Tongue. On the tip of the promontory are the ruins of what was probably a fortified watch-tower, known as Castle Varich, which looks out over the Kyle and the sea beyond. As we walked down the slope from the village, before crossing the river and climbing the steep and winding path to the castle, I looked left and was again overwhelmed by the beauty and grandeur of the mountain which dominates the skyline to the south. The mountain is Ben Loyal, at 764 m (2506 ft) by no means one of the highest of the Scottish mountains, but surely one of its most dramatic and beautiful, fully deserving its title of The Queen of Scottish Mountains. From sea-level, as one crosses the causeway across the Kyle and looks south, the panorama created by Ben Loyal and the Kyle takes our breath away every time, even though we have yet to take a photo of it which even partly satisfies us. What is so endlessly fascinating about Ben Loyal is the way it changes through the day and through the seasons, as the light varies or the weather or even, I think sometimes, our mood as we look at it. Last autumn we were here when winter arrived so early and so harshly that everyone was taken by surprise, and the sight of Ben Loyal, with every crag and gully outlined in snow was breathtaking. In previous years we have seen it still snow-clad as late as April, whereas this year spring was so early and so glorious that I was glimpsing it through the fruit blossom in the garden every time I went out to hang the washing on the line. There is something about living, even if only for a few weeks at a time, in a small bungalow close to such a distinctively strong and beautiful mountain, that is good for the soul. One’s petty concerns are put into perspective and one realises, at least for a little while, that most of the things we think are so important are nothing of the kind. I would be fascinated to hear which places do this for you.